Have you already been in Thailand? Does it seem too touristy? 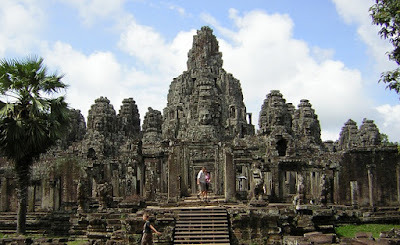 If you want to make the most of Southeast Asia give an opportunity to Cambodia. You will not be disappointed. that take you back to explore this incredible country. Cambodia is full of ancient temples and beautiful landscapes. And it's very cheap move, stay and eat there. Cambodia's capital is full of tuk tuk drivers and food stalls on the street. Move around the city and discover pagodas in almost every street, hidden among the great French colonial houses. Why do not you give one bite at a local specialty, fried tarantula? And when the cocktails get close to the Foreign Correspondents' Club, right on the banks of the Mekong River running through the city. Just outside Phnom Penh it is one of the largest mass graves in Cambodia, where it is estimated that more than one million Cambodians were executed during the Khmer Rouge regime. The scale of the place, along with the stories it tells you the audio guide, you will get excited as you consider how terrible was the country's violent past, as well as the legacy of this regime. If you can, visit on the same day the Genocide Museum Tuol Sleng. You can always get a tuk tuk make you a good price. This site World Heritage of UNESCO is by far the largest tourist attraction in Cambodia ... and possibly throughout Southeast Asia. Every year thousands of visitors travel to Siem Reap to visit the magnificent ruins of the capital of the Khmer Empire, from the ninth century. Go before dawn to see the sun rise behind his most famous temple, Angkor Wat. 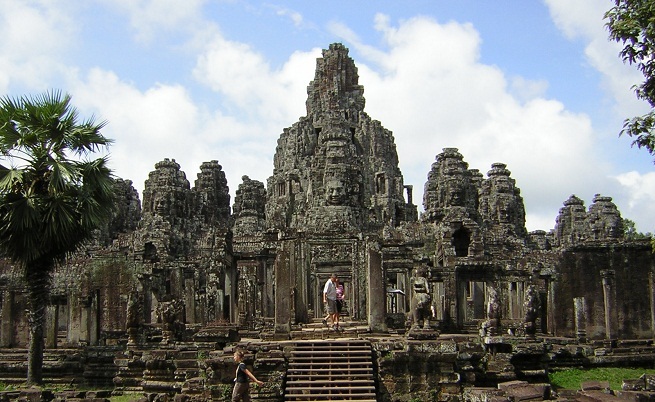 And do not miss the temple of Angkor Thom, popularized by Lara Croft and the movie "Tomb Raider". The starting point to visit the Angkor Archaeological Park, Siem Real has become a tourist destination in recent years. Take the opportunity to buy some bargains at the night market, or to make a pedicure for almost nothing, before heading to the Pubs Street for a drink. To enjoy the tranquility of the day, come to the people of Wat Bo and relax in the gardens of the oldest Buddhist temple. popularly known as "Snooky" known the main reason to stop here are its beaches, fine sand and not as crowded as those of Thailand. With six, it will cost you choose one. Less popular than the beaches of Victoria and Serendipity, Otres beach is usually quieter and is a good place for windsurfing or kayaking. Forget Koh Samui, Koh Rong is the new desert island paradise. Only accessible with a small local ferry, not many tourists who venture to make the trip from Sihanoukville to this beautiful place. With 23 pristine beaches to choose from, you will be tempted to laze in the sun and let the days go by. For the more adventurous, in addition, there are many options for hiking, diving and snorkeling. Here you will find cheap cocktails, tasty food and the best sunset over the sea. In other times famous for its production of salt and pepper, Kampot is a charming city by a river. You can spend days watching the river, eating noodles in the market or cycling through the hills ... It's the perfect plan. If you fancy something more adventurous, make a break 20 kilometers from Kampot and visit the French colonial ghost town Bokor Hill Station. Originally a retreat for the settlers, the place was abandoned when the Khmer Rouge took control of the area in the 1970s and has remained frozen in time since.